The Sri Lankan "governing apparatus that should take forward the peace process with commitment and sufficient strength is in shambles. This no doubt is an imminent threat to the maintenance of the ceasefire with due integrity," said Mr. S. P Thamilchelvan, head of the LTTE’s political division addressing the conference of northeast donors Monday in Kilinochchi. He said that "the arbitrary action" of Sri Lanka’s President "has created problems of vast magnitude vis-à-vis the integrity of the CFA and the progress of the political negotiations." "It gives us immense pleasure indeed to receive you all on behalf of our people and the national leader. You all are striving hard to bring about peace in this island and carryout a noble humanitarian service to people in distress with commitment. "In the current political crisis, many challenges are to be faced to effectively take forward the peace process and meet with urgent humanitarian needs of a people who are struggling to make ends meet in their day-to-day life. The governing apparatus that should take forward the peace process with commitment and sufficient strength, is in shambles. Governance of the legislature and the powers of the executive are heavily polarized and diametrically opposed in a game of power struggle. "This, no doubt, is an imminent threat to the maintenance of the ceasefire with due integrity. It is true that the guns are silent and we have been able to avoid loss of life. But it is also true that the Tamil people, who have faced the brutality of a horrendous genocidal war, are still unable to return to normalcy in their lives. The ceasefire agreement is two years old. Yet it is sad to mention that those noble intentions of alleviating the hardships of a people directly affected by war, enshrined in the ceasefire agreement, still remains ‘intentions’ and intentions do not alleviate the hardships. "Denying the people access back to their homes and natural habitat, an occupying army continues its occupation against natural justice. The tragedy of IDPs languishing in refugee camps continues. Resettlement, rehabilitation, and reconstruction all of which are urgent humanitarian needs, still remain unfulfilled. A people who haven’t realized the real dividends of peace are beginning to loose hope in the entire peace process. Conditions of living are deteriorating day by day. "You are aware of the fact that a sub committee, SIHRN to address immediate humanitarian needs of a people in a war affected region, was institutionalized only on realization and mutual agreement that a just and lasting solution to the conflict is time consuming and therefore urgent humanitarian needs cannot be put on hold. This institution has, by its ineffectiveness due to lack of cohesion and executive power, has tragically demonstrated that it was only an empty shell without necessary ingredients for effectiveness. SHIRN thus, is a standing example of a mechanism that cannot deliver if it is devoid of the necessary power. "During the initial stages of SIHRN, we co-opted with the government of Sri Lanka in formulating plans which were submitted to the international community. This, we did with the sincere intention of bringing back normalcy in the lives of the war affected people in the Northeast. The government however did not reciprocate with good will but opted to marginalize us. The government invariably utilized the peace negotiations as an attractive element to gravitate international assistance. This is evident in the document ‘Regaining Sri Lanka’ wherein poverty alleviation has been spread out to the whole of Srilanka without specific mention of the war affected NorthEast. Neither did this document contain any specifically identified targets for the NorthEast. It is not natural justice to equate a region devastated by war with other regions which didn’t have direct impact. "It is only under these circumstances that we insisted on full implementation of the CFA and giving effect to mutually agreed upon matters in the negotiations and decided to suspend our participation in the talks. Realizing that SIHRN failed in toto and as a consequence to the bitter disappointment we decided that it is only an interim administrative structure with sufficient executive power that can facilitate reconstruct the devastated infrastructure and bring about normalcy. "The absolute necessity for such an interim structure was explained by our National Leader in May last year to the Norwegian Foreign Minister Jan Petersen. Responding to this, the government put forward its proposals for an interim structure. We had to reject two sets of proposals since they didn’t contain anything tangible to meet the needs. We were not satisfied with the third one even. Still we prepared an in depth and comprehensive proposal with inputs from intellectuals and experts at the local and international level and broader consultation with our people and submitted it to the government. "Our proposal for an Interim Self Governing Authority (ISGA) contained within it pragmatic modalities to upgrade the devastated lives of our people, create an environment of normalcy and thereby take them along in the path to a political resolution through peaceful means. We expressed our readiness to start negotiations on the ISGA from day one itself. Hardly a week passed and the executive president, under the guise of a security threat to the nation, took over three vital ministries, vital to the maintenance of the ceasefire agreement, from the legislative prime minister leading to a virtual political crisis. This arbitrary action of the executive has created problems of vast magnitude vis-à-vis the integrity of the CFA and the progress of the political negotiations. "Already, due to inaction on the part of the government in implementing the CFA, our people were suffering immensely. Civilian dwellings are still under military occupation. Adding to this, the current stalemate has brought about a state of stagnancy in addressing urgent humanitarian needs of the people. In the south of Sri Lanka the people, a people who were not direct victims of a cruel war, are enjoying the dividends of peace. Whereas a nation of people who bore the brunt of the genocidal war is still languishing under inhuman living conditions and pushed to the brink of frustration. Expectations of normalcy dashed, these people are beginning to loose faith in peace endeavours. "During the last two years, inspire of several military provocations, we are maintaining the integrity of the CFA with commitment. At the same time we are also conscious of our moral responsibility to take into consideration the plight of our people whose day to day life is crisis- ridden and therefore would tend to test their patience to the maximum. We are morally bound to be responsive. Taking forward the peace process is entirely in the hands of the government. We are in readiness to carry on negotiations with the Sri Lankan leadership that has with it the vitally important electoral mandate for peace and the political power. The continuation of an unresolved political conflict in governance and urgent humanitarian needs of our people remaining un-addressed are definitely not going to create an environment conducive to help recommence negotiations. "In this context, it is only the international community that has the necessary clout and capability to bring the Sri Lankan government back into the peace process. It is appropriate to mention here that international aid promised to Sri Lanka is preconditioned to run parallel to the progress in the peace process. The underlying theme therefore is for the international community of donors to bring about meaningful pressure on the government to re commence negotiations. "Running parallel to that action is the humanitarian task before the international community to prevent the Tamil people who are still struggling with the consequential tribulations of war from being pushed to extreme limit of frustration. Please bear in mind that you are the only silver lining in the horizon that the Tamil people see today. If the Tamil people are still desperately clinging on to the hope of normalcy and peace, it is only because of your presence. Negotiations to recommence, an interim administrative structure to be established, it is going to take a very long time as things are today. Urgent humanitarian needs of the people cannot remain unfulfilled till then. Essential humanitarian needs for day-to-day life on the one hand, resettlement rehabilitations and reconstructions on the other, are areas that need immediate actions. "To make the people active participants in the peace process we need to demonstrate addressing effectively these problems. The people of the Northeast solicit your assistance in earnest to devise appropriate ways and means of achieving this. "We have global precedence for relevant ways and means to meet urgent humanitarian needs of the people where disbursement of relief was channeled in war torn locations. Delivery of humanitarian needs in these locations have been effectively carried out with the involvement of civilian based organizations, international and local NGOs and the active participation of the indigenous people who really are the stake holders. In the local context it is pertinent to mention here that several UN organizations and international NGOs have successfully rendered such humanitarian assistance with the involvement of CBOs and local NGOs even during the war. Standing out as a glaring example today is the humanitarian demining operation undertaken by international agencies in collaboration with CBOs. "The success of this project is a positive indicator of the viability of similar efforts in the area of resettlement, reconstruction and rehabilitations. We do have in the areas administered by us in the NorthEast, an effective administrative infrastructure with limited resources but overwhelming support and participation of the people. Economic buildup, education, health, law and order are some of the areas which we have built up over time and functioning effectively. Corruption and malpractices are things unheard of in this region. And also we have a well-structured international and local NGO collaboration in many of the social activities. What we and the people of the NorthEast expect today is a continuation and expansion of such a collaboration to meet urgent humanitarian needs which alone will successfully embrace the people and make them real partners in the peace process. "A serious lapse in the area of planning and development was the absence of a synchronized and coordinated guideline. To rectify this, we as responsible representatives of the Tamil people with a future vision, have now formulated the Planning and Development Secretariat (PDS) which will function as an official unit of our organization. This Unit will take into cognizance all the plans and need assessments carried out by various organizations up to now and formulate them cohesively, avoiding duplication so that concerted action can be taken in the areas of resettlement, reconstruction and rehabilitation. Additionally this unit will be in charge of development strategies and policy planning relating to the Tamil homeland. 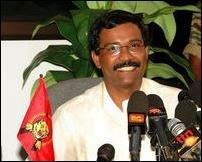 "The official position of the LTTE relating to development strategy will emanate from this unit. Inputs of local and international experts will be compiled by this unit. This unit also coordinate with the Tamil Diaspora in obtaining professional advice and is expected to spearhead the process of infrastructure development. Identifying targets focused on development of infrastructure with consultative advice from resource persons locally and internationally prepare plans and data base form part of the functions of this Planning and Development Secretariat. "Thanking you for your interest in this gigantic humanitarian effort, I leave the house open now for your comments and advice. Please feel free to express your point of view. Thank you."